The A2Y Early Edition breakfast will be undergoing a transformation in the 2018 year! 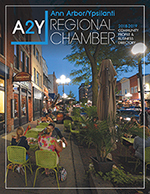 Our goal is to bring the business community together to learn about area businesses, industry leaders, and issues facing the Ann Arbor & Ypsilanti business community. Join us in September at A2Y Early Edition to discuss the future of Michigan. We will be hearing from three different organizations on their visions for Michigan’s future. Join us while we discuss what should be included in the priorities for our state. Not a Member? Please Contact Rosalind to register for this event.